A Turkish aid agency has set up an accommodations site in Syria's northern Idlib countryside for Syrians who were evacuated from the besieged eastern Ghouta district, according to a foundation official on Thursday. The Humanitarian Relief Foundation (IHH), one of the country’s leading aid groups, established the site in the village of Der Hassan. The agency's media adviser, Selim Tosun, told Anadolu Agency in Turkey's border province of Hatay that 350 families had been placed in the tent camp. “Families, who escaped a siege and arrived in Idlib after a long journey, underwent health screenings at a mobile health center," he said, adding water tankers would be meeting the needs of clean drinking water rapidly. 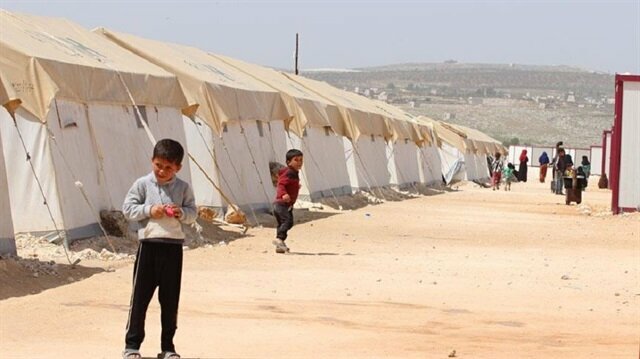 Tosun said another 150 tents and a school are expected to be set up in the site. At least 50,000 people have been evacuated from eastern Ghouta since the process began on March 22. Evacuations are being carried out as part of a Russian-brokered agreement between Syria’s Bashar al-Assad regime and armed opposition groups. Home to 400,000 residents, eastern Ghouta has remained under a crippling regime siege for the last five years, which has prevented the delivery of badly needed humanitarian supplies. According to UN officials, hundreds of thousands of people have been killed in the conflict in Syria to date.